The “Hobbybrouwerij Het Nest” (Home Brewery the Cradle) has been created in 2007. Hosted in Turnhout, the creators quickly noticed that this city is the main producer of playing cards in Europe. 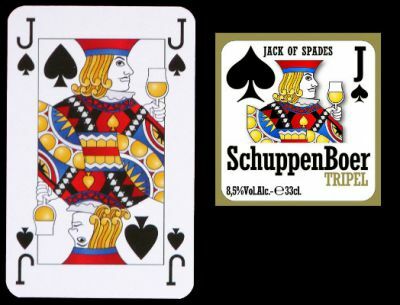 Therefore they chose to illustrate their beer labels with playing card features like the jack of spade (Schuppenboer) for their triple blond beer, close to the English pattern but holding a glass of beer. After some time, it was possible to design a pack a cards, assuming that the figures are identical for all suits. This pack of 55 cards is alas very hard to find. Price and where to find: Sold with a pack of five different bottles of beer.